The Konova Tripod Stability Arms offers that much needed extra support at each end of your Slider when working with just one tripod. It props up each end and prevents dipping and sagging as you shift the weight of your camera side to side. On the top it has a large thumb knob with 1/4" male thread that can attach to most sliders (here i'm using an iFootage 3-axis Motion Control Kit), and on the bottom it uses a Nano Clamp to clamp anywhere onto one of your tripod legs. There are ball joints on each end so it can easily be aligned and positioned. In the center it is telescoping to extend of contract. 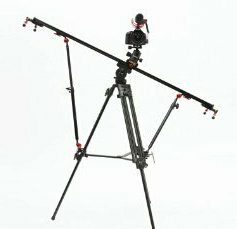 The Tripod seen in this article is the hefty iFootage Wild Bull T5 (found here). Posted in Instagram FEED. Tags: ifootage wild bull tripod, konova tripod stability arms, slider arm, slider support, tripod arm, wild bull T5 on November 4, 2016 by Cheesycam.